Do you have crafters on your holiday gift list? 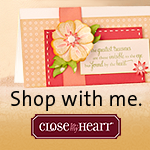 Don't you think they'd appreciate a gift from Close To My Heart? I know if I was a crafter, I would. LOL! And...since the holidays are quickly approaching, it's probably smart to start getting some of those purchases crossed off the list right? Well, head office says that the deadline for holiday orders is midnight December 8th (whether placed online or through me) but since the courier's don't guarantee shipping time frames at this time of year, my recommendation, plain and simple is to shop sooner. In fact, if you want to be guaranteed that your holiday shipment will arrive on time AND get a little something extra too, keep reading, because I've got a special holiday treat for you. Gift Wrap your order so it's all ready for holiday giving. I'll pay the shipping and give you an additional 5% discount! That's right. I said, Free Shipping* and an additional 5% discount! This equates to a savings of 15% on your order total! This offer is only valid for orders placed through me between November 24th and November 30th. This offer is not valid for shoppers at my online store. * Note: The free shipping offer refers to the cost of shipping the order to me, for pick-up by you, at your convenience. Secondary shipping fees, if required, are excluded from this offer and will be paid by you. So, mark those dates on your calendar, and remember to contact me between November 24th and November 30th to place your holiday gift giving order! This deal is too good to miss!